What does this headline tell you? It tells me we no longer even pretend that presidential “debates” are anything more than reality TV. This entry was posted in Current Events, Politics and tagged current events, politics. Bookmark the permalink. 6 Responses to What does this headline tell you? I’m hoping that there is some basis in science and the study of body language behind that article, but for some reason I highly doubt it. Articles such as that are a large part of the reason I don’t care to follow politics at all. When you’re looking for a leader, you want the person who acts confident and looks like they’re ready to take command of the situation, not the person who seems like they just want to leave the room because they keep staring at their watch. I still think it’s the wrong thing to focus on, but not quite as much BS as I originally thought. I think you’ve hit it, Adam. On TV, visuals matter. The first televised debate was 1960, between Kennedy and Nixon. The election was close, and commentators since then have said a key factor may have been Nixon’s refusal of makeup for the camera. I guess makeup wasn’t manly then, but he didn’t understand media, and when you see clips, with his five-o’clock-shadow, he really does come off a bit seedy. I’m sure even Lincoln and Douglas in their now legendary debates, did a bit of grandstanding for the crowd. But I think in modern times, the breaking point may have been 1988, when the League of Women Voters stopped sponsoring presidential debates, claiming the formats had tipped too far toward sound bytes and too far away from substance. I missed the first debate – that night I actually had a real political event – a meeting with the County Board of Supervisors that a sleazy developer had scheduled to conflict with the debate in hopes no one would show up (luckily someone got the word out and the place was jammed). Augggggh! Will this election never end???? 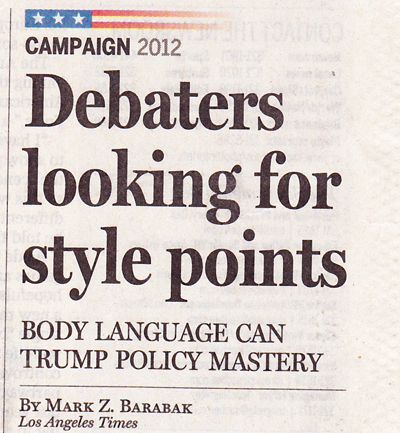 And as I recall, the primary debates began in Sept., 2011. Since when did campaigns run for a full quarter of the presidential term?